By default, every case in your data counts as a single case. However, you can have each case count as more or less than one case as well. This is called weighting. For instance, the first case in your data may count as 2 cases and the second one as .5 cases. These numbers, the case weights, are contained in a weight variable. Running WEIGHT BY [...] tells SPSS to treat the values of some weight variable as the active case weights. Note that the status bar informs you whether weighting is in effect or not. Similarly to SPLIT FILE and FILTER, WEIGHT has three main commands. WEIGHT BY [...]. switches a weight variable on. 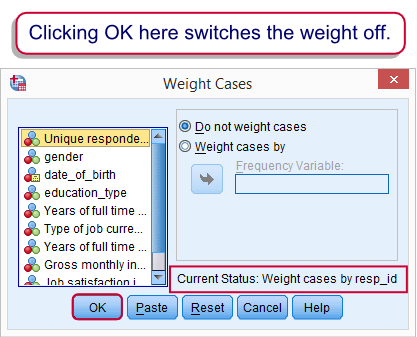 If a weight variable is already in effect, it can be used for setting a different variable as the active case weights. SHOW WEIGHT. shows which variable is currently used as the weight variable. WEIGHT OFF. switches the case weights off. After doing so, every case counts as a single case again. In contrast to SPLIT FILE and FILTER, the active weight variable is saved with the data. So when you start SPSS and open a data file, a weight variable may already be in effect. An active weight variable does not only affect the output that's generated. Some data modifications are also influenced by case weights (most notably AGGREGATE). Some users inspect which weight variable is in effect from the menu. When seeing current status: Weight cases (...), they agree with that and click OK. However, this turns the weight variable off. Why Would you Weight Cases? Your sample is not representative for the population you're investigating. For example, you may know that 50% of your target population consist of females but you have 80% females in your sample. In this case you can weight down these 80% of females to 50% of your sample by assigning case weights of .625 to them. Similarly, you can weight up the 20% male respondents to 50% of your sample as well by using weights of 2.5. Note that these weights don't correspond to the numbers of observations actually made. In this scenario, weights typically have a mean of 1 so the weighted sample size is exactly equal to the unweighted sample size. We'll demonstrate this scenario with the example below. In some cases you only have aggregated data. A typical example is a contingency table ("crosstab") presented in a book or article. In this case, case weights will al be positive integers. In this case, weights correspond to the numbers of observations that were actually made. You may trick SPSS by using weights in some cases but this is beyond the scope of this tutorial. Running the syntax below creates these data and computes mean incomes for male, female and all respondents. *1. Create some test data. data list free / case_weight gender income. value labels gender 0 'Male' 1 'Female'. Note in the screenshot above that female respondents have higher average incomes and are overrepresented as well. The result of this is that the estimated mean income for the entire target population (€ 2370,-) is biased upwards. We can correct this by weighting our respondents as described earlier. The syntax below demonstrates how to do so. *3. Weight cases + quick check, then run weighted mean incomes. *4. Switch off weight and do quick check on it. In the screenshot above, first take a look at the sample sizes. They're now equal for females and males, thus rendering the sample representative of the target population with regard to gender. Also note that the total sample size is still 10. This is because the average case weight is exactly one. Second, the estimated mean income for our target population is now € 2268,75-. This is because we correct for the aforementioned upwards bias by weighting. Did you mean if it's ok to run a chi-square independence test on 2 Likert items with WEIGHT on? -If the WEIGHT variable contains frequencies (all positive integers > 1) that really indicate the number of people who gave some answer, you can safely test for statistical significance -including chi-square tests. -The WEIGHT variable contains non-integer values (such as 0.8, 1.2, 2.3 and so on) with an average of one. Each case in your data represents 1 person but the WEIGHT variable is used for rendering the sample (more) representative of some target population. In this case, all statistical significance tests (including chi-square) will be biased. In this case you should use the SPSS complex samples option (module) for the correct results. Is it right to use weight when calculating likert type data using chi-square test? Yes, your syntax looks great! Also see IF.